Scientists Have Figured Out How to Make Electricity Out of Unused TomatoesFlorida’s tomato waste could theoretically power Disney World for 90 days. This Tomato Burger Is One More Dish to Eat Before It’s Too LateIt’s only available three days a week, and it always sells out. Pay Good Money to Be Part of a Massive Tomato BrawlBring protective eyewear. Indigo Rose: The Tomato That Fights Free RadicalsA striking new purple variety that acts more like a blueberry. In Season: Yunnan Kitchen’s Raw-Green-Tomato SaladAlthough it might seem slightly perverse during these still peak tomato days to recommend you find some nice hard unripened ones, that is exactly what we’re doing this week. 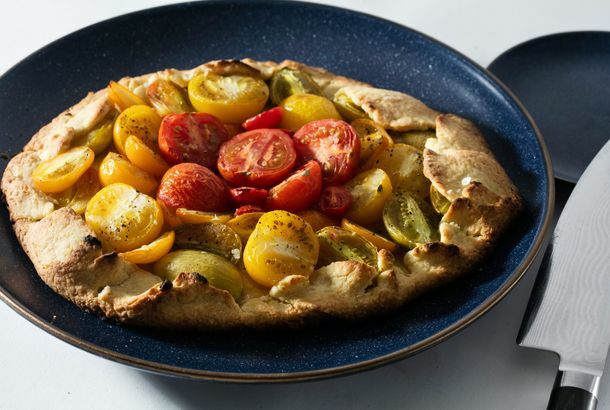 Supper and Bistrot La Minette Team Up For a Two Night ‘Home-and-Home’ TomatoThe two night tomato extravaganza takes place at both restaurants. Why Heinz Never Goes BadTomatoes are tougher than T-Rexes. Special Menus at Drago Centro and Il Grano Turn L.A. 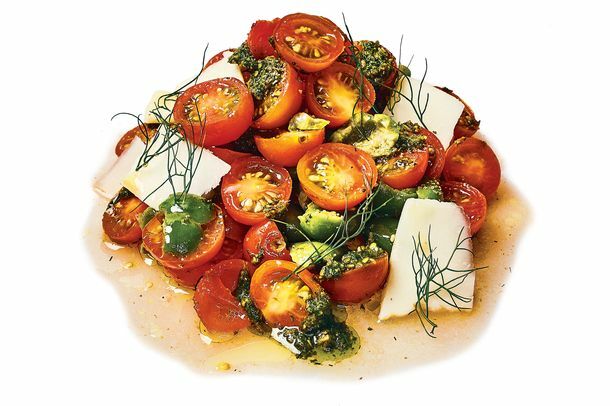 Into La Tomatina!Two of our favorite Italians get creative with the summer’s ripe red bounty. Salmonella Scare Prompts Tomato Recall in PA and NJ; As Food Prices Rise, So DoPlus: Tilapia isn’t all it’s cracked up to be; and eating more hot red peppers may help with weight loss efforts, all in our morning news roundup. Platt Tries Out the Plaza Food Hall; In Search of the Best TomatoPlus: A wild-blueberry pancake recipe from Vandaag, and Stuzzicheria finally opens. Bistro St. Tropez Offers Peachy-Tomatoey Love Throughout AugustThe two prix fixe menus highlighting tomatoes and peaches will be available nightly. Peter Woolsey Explains Menu Changes at Bistrot la MinetteBoredom, whimsy and hatred are couple of the factors the chef cites for menu changes. Jamie Oliver Blasts U.S. McDonald’s; SK Foods’ Boss Slapped with Five MoreThe Naked Chef has healthier Golden Arches back home and the tomato industry’s public enemy #1 is in more trouble. 7-11 to Sell Its Own Beer; Courage the Dog Gets His Own CupcakeThe country’s third biggest beer retailer creates Game Day brew and the story of a rescued pup inspires a Virginia baker. Cakegirls Issues Refunds; Kids Nonplussed by Jamie OliverPlus: tomatoes go year round, and McDonald’s trains in China, all in our morning news roundup. Underage Drinking at Daisy Buchanan’s; Shellfish Beds Closed for RainPlus: football meets food at the Times, and kids nonplussed by Jamie Oliver, all in our morning news roundup. Calorie Counts on the Horizon; Tomatoes Still ScarcePlus: USA Today comes to Starbucks, and the benefits of eating alone, all in our morning news roundup. Cookout Turns Deadly; Continental Charges for FoodPlus: tomato crisis carries on, and big trouble for Qdoba, all in our morning news roundup. Red Alert: Tomato Shortage Hits NYCYour next BLT may come without the T.
Condensed Makes a Comeback; McDonald’s Tries OatmealPlus: Fresco by Scotto goes national and ‘America’s Test Kitchen’ becomes a video game, all in our morning news roundup. Underground Dining: So Hot Right Now; Your Resume on a CookiePlus: an apologetic bakery thief, and tomatoes disappear from restaurants, all in our morning news roundup. Criminal Misdeeds Catch Up with Cali Tomato IndustryA major investigation is launched into illegal produce practices. Watch The Chicago Skyline Get Eaten By A Tomato VineA Red Gold ad swathes the Willis Tower in tomatoes. Masa’s Tomato Dinners Last All September LongThe season’s best produce comes eight ways on Masa’s tasting menu. Advice From the Experts: The Best Tomatoes of 2009Our expert shares the hits and misses of this year’s staff tasting. Scallops Looking Good; A Very Heavy TomatoPlus: vegetable gardens for small businesses, and Gourmet turns to TV, all in our morning news roundup. Despite Blight, Tomato Contest Carries OnThe 2009 Tomato Contest is being judged today. Tasting Tomatoes with Oliveto’s ExpertsAs tomato season ramps up, Oliveto chefs taste ‘till it hurts. U.S. Sugar Supply Could be Endangered; Bank Robber Disguised as ChefCompanies allege sugar supply could run low due to restricted imports and high prices while a Georgia bank robber wears a chef’s uniform while stealing. Dan Barber Blames Tomato Blight on Home GardenersThey’ve “set the stage for the worst local tomato harvest in memory,” he writes. Fungus Attacks TomatoesEast Coast tomatoes are succumbing to a late blight. Scott Conant Preens About His Tomato-Sauce MasteryScott Conant whips out his sauce recipe. Wine Bar Touch-Screen Trend Continues at Clo; Brooklyn Becoming a WineCritiquing Park Slope’s garbage, there’s no such thing as a frozen brownie with negative calories, and more, in our morning news roundup.